"There is honesty, beauty and authority in the Legend's sound, and seemingly in equal parts." Sound "The SL1 Legend's line stage has the uncanny ability to delineate musical parts while at the same time conveying a powerful, resounding whole." "The music flowed with both naturalness and acute precision." "Bass had crunching heft when it was on the recording, while cymbals, triangles and brass overtones had what can best be described as residence in the soundfield -- the antithesis of wispiness that seems to be more decay than attack." The phono stage "was so pure and natural, so truly neutral, that it essentially mirrored the preamp's line stage, even with the extra tubes and transformer in the circuit." "I always felt great anticipation when returning to listen to the SL1 Legend, this becoming with time contentment, and then admiration." Features "A cost-no-object implementation" -- "'a whole bunch of little-betters put together.'" "The Legend's 46-position shunt volume controls are more costly than those used for the standard SL1," and its "Black Gate graphite-particle caps...cost ten to twenty times more and are no longer in production." Circuit boards are made of Teflon. "The Legend has the same tubes in its line and phono stages: a matched pair of 6922s, a single 6922, and a matched pair of 12AX7s." "The Legend's optional phono stage uses a special low-gain step-up transformer in conjunction with an initial moving-magnet stage to deliver 58dB of gain." Use "As with previous CAT preamps, the Legend's line stage provides a lot of gain -- 26dB -- but unlike with its predecessors, gain is adjustable via a switch inside the control unit, which reduces it to 15dB. The SL1 Legend arrives set for 26dB of gain. If you hear hiss through your speakers, reducing the gain should do away with it." Value "If it takes years of tinkering to produce a preamp like this one, so be it. Greatness, as they say, can't be rushed." Time marches on, and audio products of all kinds get better and better -- the opinion of cynics notwithstanding. There are many reasons for this steady improvement, including better parts and manufacturing techniques, but I think the driving force behind the continual forward movement of audio performance lies in people, specifically those who design the speakers, amplifiers and CD players we audiophiles can't live without. Think about it: Aren't you better at your job now than you were when you started? If you've been promoted, you have concrete proof of your improved performance. Why should it be any different for someone who designs audio circuits, especially when that person has been at it for decades? It's not. Speakers, amplifiers, CD players and the like are refined over time. This, along with improved parts, makes for products that push with even greater force at the boundaries of reproduced sound. There may be no better example of this than the Convergent Audio Technology -- CAT for short -- SL1 preamp. Introduced 25 years ago, it has been tweaked and updated numerous times since. I owned one more than a dozen years ago, and I swear I could hear a difference between the unit I auditioned prior to purchase and the one I eventually bought. I blame this on Ken Stevens, who for those two-plus decades has never said, "I can do no better." Even though the basic circuit of his SL1 hasn't gone through wholesale change, Ken has, adding to his mental database of passive parts and picking the best of them for use in his preamp -- and his amplifiers. It is curious, however, that while Ken continued to make his initial product better, he designed and built an exceedingly small number of completely new products. Then, a couple of years ago, the SL1 Legend preamp was born -- well, sort of. We first covered it at the Munich High End show in 2004, and then again at CES in 2006. In 2007, it was finally released for sale. I can't say for sure, but I suspect that tweaking ensued over the course of this time and probably up to the point where I received a Legend for review late in 2008. As Ken explains it, "My equipment is a whole bunch of little-betters put together." And, naturally, it takes time to discover what all those "little-betters" are. Ken is a gregarious fellow who embodies a pair of disciplines that don't easily or naturally go together. On the one hand, he's a college-trained electrical engineer who worked for a high-tech company before starting CAT; at one point, he built every CAT product himself. On the other hand, he's an astute audiophile who trusts his ears when it comes to making many decisions regarding the ultimate form his products will take. Ken has listened to more resistors -- "50 to 100 brands" by his recollection -- than most people know exist. He makes his own nonelectrolytic capacitors because he couldn't find a commercial cap whose sound he liked. How many audio companies make their own caps? Only a few. Even big companies with the financial resources to do it rely on off-the-shelf parts. Not CAT. Ken Stevens' independence of mind is equaled only by his technical knowledge -- and hearing -- and he uses both in identifying and selecting the best parts for his products. The SL1 Legend ($19,950 USD with phono stage, $16,950 without) takes this uncompromising approach further than the product with which Ken literally started the company, the SL1 preamp, now in its Renaissance version ($9950 with phono stage and $7950 without). The two use essentially the same circuit, but in the case of the Legend that circuit is taken to the extreme -- it's a cost-no-object implementation. On the outside, the two look nearly identical, but there are a couple of notable differences. Chief among these is the use of dual volume controls in the Legend instead of separate volume and balance. Both preamps use stepped volume controls, essentially a set of resistors for each setting, but the Legend's 46-position shunt volume controls are more costly than those used for the standard SL1, whose fewer positions cause issues for some owners, as the perfect volume setting can sometimes lie between two "clicks." Not with the Legend; 46 positions should be enough for even the pickiest listeners. Ken Stevens is also a great believer in controlling resonance through physical means, which is why the top and bottom plates of the Legend are made of a layer of steel overlaid with a layer of machined aluminum. 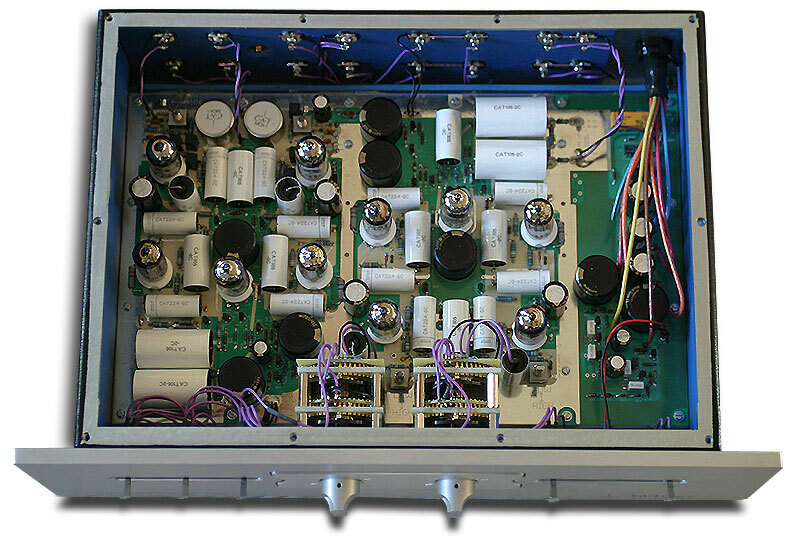 This is in addition to the preamp's steel chassis and the liberal use of a resistive damping compound inside. The standard SL1 and the Legend measure the same -- 19"W x 5 1/4"H x 12 1/4"D for the main chassis and 12 1/4"W x 4"H x 6"D for the connected power supply -- but the Legend weighs even more: about 80 pounds. The top and bottom look like they're armor, but they make for an incredibly solid piece of audio gear -- like a cinder block filled with cement. Inside is where the difference in price between the two preamps is most apparent. The circuit boards for the standard SL1 are made of G200, a material that's far more expensive than the substrate that's used for most circuit boards. In the Legend, it's Teflon, which is "a lot more expensive" than G200, according to Ken. Electrolytic caps are replaced with Black Gate graphite-particle caps that cost ten to twenty times more and are no longer in production. "They are so much better than other electrolytics," Ken told me, touting their "organic sound." "And you can hear them very clearly in the Legend," he said. He has instant recall of hundreds, maybe thousands of passive parts whose intrinsic sound he knows well. The Legend's optional phono stage uses a special low-gain step-up transformer in conjunction with an initial moving-magnet stage to deliver 58dB of gain. The transformer can be set for an additional 6dB of gain, but this is only recommended for cartridges whose internal impedance is under 10 ohms. Because of its low gain, the transformer's response is much flatter than that of others -- drifting less than 0.02dB from 20Hz to 20kHz. It also features unmeasurable amounts of distortion and a very high 4200-ohm input impedance. Cartridge loading is accomplished with RCA plugs included with the preamp. Like earlier SL1 models, the Legend is fully single ended. There is no multi-pole input selector. Instead, there are high-grade toggle switches to choose among the four inputs (two line, one phono or line, and one tape) because Ken thinks the switches sound better. The Legend has the same tubes in its line and phono stages: a matched pair of 6922s, a single 6922, and a matched pair of 12AX7s. As with previous CAT preamps, the Legend's line stage provides a lot of gain -- 26dB -- but unlike with its predecessors, gain is adjustable via a switch inside the control unit, which reduces it to 15dB. The SL1 Legend arrives set for 26dB of gain. If you hear hiss through your speakers, reducing the gain should do away with it. The Legend's separate power supply also uses Black Gate caps and the same CAT-designed isolation transformer as the standard SL1. It's because of the isolation transformer that Ken cautions against using any power conditioner with his preamps, and he includes a beefy power cord along with each unit. The power supply is permanently connected to the control unit, which makes putting the preamp on anything but the top shelf of your equipment rack a feat of strength and dexterity. The umbilical is long enough that you can easily hide the power supply in an out-of-the-way spot and not have it occupy another shelf. The Legend, like the standard SL1, has no remote control. Before you consider this a rash oversight and deal-breaker, give it a try with your existing preamp by hiding the remote or taking the batteries out. It becomes a trifle in no time, especially when you are listening attentively. It's far more bothersome to deal with the Legend's dual volume controls, though simply counting the clicks when you adjust one solves that. Once I found a good spot, I moved up or down a maximum of three clicks. Any given configuration of my system is heavily biased toward balanced electronics, especially when the Audio Research Reference 3 preamp is at the center of things. Ken Stevens, in contrast, designs single-ended circuits exclusively, believing that any theoretical sonic improvement of a balanced circuit is offset by its added complexity, parts count and cost. Fully balanced digital sources, for instance, always sound their best from their XLR outputs, and that's how I've always used them. Thus, using them with the CAT preamp would mean essentially changing two system variables at a time -- and getting skewed results. But I made do, pairing the SL1 Legend with sources and amplifiers that were single ended and whose sound I knew well. Amplifiers were the CAT JL3 Signature Mk 2, Lamm M1.2 Reference and ML3 Signature, and Raysonic M100 monoblocks. The primary digital source was the Zanden Model 2000P transport and Model 5000S DAC connected via their I2S cable. I also used an Ayre C-5xe universal player and Audio Research Reference CD8 CD player. 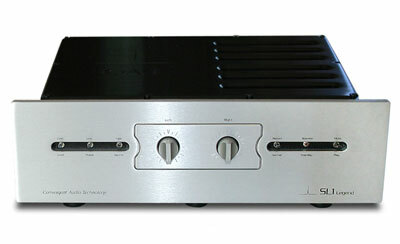 Preamps for comparison were an Audio Research Reference 3, which can be used single ended, and an Aurum Acoustics CDP, which doubles as a high-quality CD player. Speakers were Wilson Audio MAXX Series 2s and Series 3s, with a pair of Raidho Ayra 3.0s in between. LPs spun on a TW-Acustic Raven AC turntable with two tonearms: a Graham B-44 Phantom for mono playback and a Tri-Planar Mk VII UII for stereo. Cartridges were mono and stereo versions of the Dynavector XV-1s. Phono stages were the internal one for the Aurum Acoustics CDP, and the outboard Audio Research PH7 and Lamm LP2 Deluxe. I tricked out the turntable with a Harmonic Resolution Systems (HRS) Analog Disk record clamp/weight, an HRS Nimbus Coupler and two Spacers under the motor, and a Boston Audio Mat 2 record mat. Preamps, phono stages, the turntable and the single-box digital players all rested on a Silent Running Audio Craz 4 Reference equipment rack. The Lamm amps had dedicated pairs of Silent Running Audio products underneath: Virginia-Class platforms for the Lamm ML3s and Ohio Class XL Plus2 platforms for the M1.2s. The Zanden digital separates rested on HRS M3 isolation bases. Interconnects and speaker cables were AudioQuest William E. Low Signature or Shunyata Research Aurora-IC and Aurora-SP. A Shunyata Research Hydra V-Ray -- both the original and Version II -- and a number of Shunyata Anaconda Helix and Python Helix power cords -- both Alpha and Vx versions -- handled power duties, trading time with an Essential Sound Products Essence Reference power distributor and a number of Essence Reference power cords. I also used the hefty power cord included with the SL1 Legend. Phono cables were an AudioQuest LeoPard used with the Graham tonearm and the Cardas-sourced cable that's integral to the Tri-Planar tonearm. Setting up a turntable for use with the Legend's phono stage takes a little experimentation if you're using a high-quality low-output moving-coil cartridge. Given the price of the Legend, you are almost certainly going to use such a cartridge. The step-up transformer's very high impedance means that you may have to load down your cartridge more than usual in order to effect a natural spectral balance that's not too heavy on the treble. CAT includes five different values of loading plugs (20, 50, 100, 150 and 300 ohms), so experimentation is easy. I initially settled on 300 ohms with my Dynavector cartridges and grew accustomed to the sound. A few weeks later, Ken Stevens visited and suggested removing the plugs completely and running the phono stage "wide open," with no loading. At first, this sounded bright to me. I kidded Ken that he had discovered "an old-ears compensation circuit" that remedied age-related hearing loss. But Ken's suggestion proved to be a very good one. The no-load option sounded more energetic, open and spacious than 300-ohm loading, differentiating each recording better. Give no loading a try, even if the maker of your cartridge recommends some specific value. You just might like it. I reviewed the SL1 Ultimate Mk 2 almost two years ago, and it made quite an impression on me. Still, keeping that impression firmly in mind, I can say that the SL1 Legend is much more than a mere upgrade, its overall sound improving on the Ultimate Mk 2 in a number of ways -- and on other top-level preamps I've heard as well. The SL1 Legend's line stage has the uncanny ability to delineate musical parts while at the same time conveying a powerful, resounding whole that is honest to the recording's scale, whether impossibly large or pinpoint small. This is the aural canvas on which the rest of the Legend's performance is drawn, and it's a significant sonic achievement, combining high resolution with an organic musical nature and making for carefree listening. Bruce Springsteen's best recent album is We Shall Overcome: The Seeger Sessions (Columbia 82867 2), a DualDisc whose DVD side registers at CD resolution but may, in fact, be slightly more high rez, as it sounds a bit better than the CD side. The SL1 Legend made the difference plain, even via a balanced Ayre C-5xe used single ended. The music is loosely played and the recording is nothing special; the sheen of a grandiose production would ruin the music's old-as-the-hills patina. Its freewheeling nature was well served by the SL1 Legend, through which the music flowed with both naturalness and acute precision. As mentioned, there was also a feeling of power to the Legend's sound, not an additive sense of midbass weight, for instance, but a solidity from its limits at both ends of the musical spectrum. Bass had crunching heft when it was on the recording, while cymbals, triangles and brass overtones had what can best be described as residence in the soundfield -- the antithesis of wispiness that seems to be more decay than attack. Dynamic expressiveness was resolute and complete, with the Legend showing a fiery way with big swings in volume and dexterity with smaller changes from single instruments. From symphony orchestra to solo guitar, the SL1 Legend proved its mettle throughout the frequency and dynamic spectrums. One area in which digital generally shows its superiority to vinyl is the bass, which on otherwise identical recordings seems to go a bit -- or quite a bit -- lower and sounds more variegated from recording to recording. Analog, on the other hand, often outlines an upright bass, for instance, far better, differentiating it from the kick drum and other instruments that flit into and out of its frequency range. A recording that illustrates all of this is Talking Heads Stop Making Sense, whose low end throbs on both the LP (Sire W1-25186) and CD (Sire 25186-2). It sounds more detailed on LP -- better outlined from the rest of the music -- and more visceral on the CD. It takes a special audio system to reveal this distinction, especially while not sounding etched in the upper midrange and treble. The SL1 Legend will never be the part of the system that congeals the low frequencies into an amorphous mass or do anything but lay out the midrange and treble with endearing smoothness and, when called for, physicality. Einstein's The Tube preamp that I reviewed three years ago had tremendous, and tremendously apparent, bass. The Legend's low frequencies are more self-effacing, expertly integrated into the rest of the musical spectrum, and it offers greater presence throughout the midrange and treble too. As you might guess, therefore, showiness is not the SL1 Legend's bag -- the Einstein preamp is far more extroverted and attention-grabbing. Instead, the Legend's great resolving power comes from within, its poise and naturalness never secondary -- or primary -- to the display of musical detail. Everything is in proportion. To my ears, this is the absolute ideal: for the music never to be overshadowed by the components that reproduce it, and for those components to be truly neutral -- showing no tendencies of their own. This is what's so appealing about the very best analog playback: the tremendous capability of a turntable-tonearm-cartridge system to convey huge amounts of detail, always presenting it within the fabric of the music itself. This provides a useful segue to discussion of the SL1 Legend's phono stage, which does the two jobs that it should: provide lots of gain and do so with a minimum of noise. My Dynavector cartridges are firmly in the low-output camp, so they tax a phono stage's gain and noise capabilities, clearly revealing any issues. In terms of the mechanics of the phono stage's handling of the tiny signal coming from the cartridges, the Legend's low-gain step-up transformer did the job without drama. Its sound was so pure and natural, so truly neutral, that the phono stage essentially mirrored the preamp's line stage, even with the extra tubes and transformer in the circuit. I spent far too much money at CES this year on vinyl, most of it at the Classic Records booth at THE Show. While Music Matters deservedly gets nearly endless praise for its Blue Note reissues, Classic Records' LPs don't get nearly the recognition they deserve, especially the mono titles, which have sounded uniformly wonderful. The sleeves are brightly reproduced and substantial too. Classic Records was sold out of the Sonny Rollins classic Volume 2 (Blue Note/Classic Records 1558), but I tracked down a copy online, and it was worth all of the digging. What a glorious mono title: an all-star lineup, including a young and fiery Rollins' trading notes with a young and exploratory Thelonious Monk, making music that can rightly be called historic. An original of this LP would cost far more than the Classic reissue, and through the Legend's phono stage it would sound brighter and crisper -- it wasn't produced for such high-fidelity playback equipment. The reissue, however, sounded well balanced and big, my mono cartridge conveying the luscious directness of mono playback, making a case for this being the very best way to hear this music. Ditto for the contribution, or lack thereof, of the Legend's phono stage, a well-spent $3000, I can assure you. In fact, if Ken Stevens decided to offer this phono stage as a separate product, perhaps with a burly chassis like that of the SL1 Legend, including an outboard power supply, he could charge the five-figure price of an elite separate phono stage and get it. If you contemplate buying an SL1 Legend, buy the phono stage too, even if you're all digital. If it doesn't provide the impetus for some analog experimentation, it will surely add to the value of your preamp. It's a bargain. The ideal comparison product for the SL1 Legend is the current version of the standard SL1, the SL1 Renaissance. While I have an entire review from which to draw conclusions about the SL1 Ultimate Mk 2, for instance, it has been such a long time since I heard that preamp that I can't make useful comments about its sound versus that of the Legend. I can say that I think the two sound similar in broad ways, with the Legend's Black Gate caps giving it a smoother though no less detailed character, but beyond that I would be speculating. If I can pry an SL1 Renaissance from CAT, I promise to write a follow-up review that talks about both preamps in depth. Fortunately, I did have two very good preamps on hand that I could compare to the Legend, though I would have to take into account some broad differences among all three units. The Aurum Acoustics CDP ($16,000 with optional phono stage), for instance, is a solid-state line-stage preamp with single-ended and balanced inputs and outputs, but it is not fully balanced itself. It is also a very good top-loading CD player with volume control. Like the SL1 Legend, the Audio Research Reference 3 ($9995) uses tubes, but it's fully balanced. While it does have single-ended inputs and outputs, it sounds its best balanced. The Lamm monoblocks I had on hand have both single-ended RCA and balanced XLR inputs. However, the M1.2 Reference amps have such high gain that they only produce hiss-free sound with the CAT Legend when the preamp's gain is reduced. The amps sound very good with the Reference 3, however. The Lamm ML3 Signature amps, on the other hand, sound wonderful with the CAT preamp at full gain but somewhat dark with the Reference 3, which switching from the 4- to the 8-ohm outputs on the amps ameliorates to a great degree. The Aurum CDP works well and sounds very good with both amps. I offer all this as background to my comments. I had to construct my impressions based on combinations of amps and preamp, instead of merely swapping out preamps. The strengths of the Reference 3 are its dynamic prowess -- the realistic way it scales with the music as dynamics change -- and its rich tonal palette, which gives instruments natural color. The SL1 Legend equals it in both of these areas, and betters it in terms of conveying fine detail and bass power. The overtones heard on well-recorded jazz, such as Bruce Barth's Live at the Village Vanguard CD (MaxJazz MXJ 205), seem more abundant, though that's not actually the case. They just don't recede as early, becoming mixed with the fine gauze at the very threshold of the Reference 3's noise floor. Down low, the SL1 Legend conveys slightly more depth and weight, adding some punch to the kick drum of Keith Richards' Main Offender CD (Virgin 86499 2), for instance. The Reference 3 sounded a touch sweeter in the upper midrange, smoothing over an almost infinitesimal bit of amusical hash from poor digital recordings, but the SL1 Legend was probably more accurate, letting more of each disc's sound through. The Aurum Acoustics CDP sounded thinner and slightly brighter than the Legend, though no more fleet into and out of each note, for instance. It also didn't have the palpability of the CAT preamp from the midrange down or its bass power. The Legend sounded fuller and more vivid throughout the midrange, and its bass displayed greater ambience when it was on recordings -- like Main Offender. The bass of the Aurum CDP was leaner and tighter, though it lacked the more realistic weight and spread of the CAT preamp's low frequencies. I did do some direct comparison of the Legend's phono stage to the Audio Research PH7 ($5995) and Lamm LP2 Deluxe ($7290). The PH7 derives all of its gain from active devices, while the CAT and Lamm phono stages use active devices and step-up transformers. They are very slightly quieter than the PH7, as I would expect, but they don't quite convey the PH7's sense of space, which is one of its strengths. The CAT phono stage is more resolute in its way with musical detail, voices especially sounding more corporeal. The Lamm LP2 Deluxe is somewhere between the two, presenting an airy soundstage and full images. The Legend's phono stage is a split hair more quiet than the LP2 Deluxe, somewhat more dynamic, definitely more colorful, and clearly more bold, especially with recordings that are quiet, dynamic, colorful and bold. What all of this parsing of similarities and differences proves is that the SL1 Legend has both analog and digital covered with equal acuity. Comparing preamps with different amps can make your head spin, but I always felt great anticipation when returning to listen to the SL1 Legend, this becoming with time contentment, and then admiration. "A whole bunch of little-betters put together"
Convergent Audio Technology's low profile belies the state-of-the-art sonic performance of its products, which are the outgrowth of the energy and astute hearing of Ken Stevens. I've now heard three of Ken's products -- he currently makes only four -- and each has impressed me with the way it gets the best out of its tube-based circuits while displaying none of the drawbacks that lesser products can and do. I raved about the SL1 Ultimate Mk 2 preamp and JL2 Signature Mk 2 amp, but the SL1 Legend goes beyond them, not only in its execution but in its performance as well. There is honesty, beauty and authority in the Legend's sound, and seemingly in equal parts. Yet, as Ken Stevens espouses, it's the cumulative effect of a lot of things that makes the Legend what it is. Given its many and varied strengths, the CAT SL1 Legend is the finest preamp I've had in my system. If it takes years of tinkering to produce a preamp like this one, so be it. Greatness, as they say, can't be rushed. Prices: $19,950 USD with internal phono stage, $16,950 for line stage only.